The questioning of Rangers management with regards to their signing policy & more specifically, the lack of youngsters progressing through the youth system is certainly nothing new. Whether you are on forums, social media sites or at Ibrox it is impossible to escape the frustration of fans on these issues. Back in 2012, when Rangers were demoted to the fourth tier of Scottish football, many Rangers fans saw this as the perfect opportunity to integrate a large number of promising youngsters from our youth side into the first team. Consequently by the time they got back to the top flight, there would have many youngsters having played 80 plus first team games at a very young age. Ally McCoist famously said he wanted Rangers to have the youth development model of Ajax & Porto. Due to the restrictions in Scottish football, it is clear that this was the vision the club should have embraced & it still should be the club’s philosophy. Disappointingly, Ally certainly has not followed through with his stated “vision” for the club. Instead, Rangers are the dad’s army of Scottish football. Due to their terrible signing policy, the club seems to only sign former players who are 30 years old or over – how very inspiring. If we look at youngsters who have broken through into the first team – we are talking only about Lewis Macleod & Fraser Aird. Both are highly talented youngsters with the former possessing so much ability & potential it excites many fans yet McCoist consistently play him out wide out of position. I am not advocating for Rangers to play eleven teenagers, week in week out, as you do need the right blend of youth & experience. However the fact only two young players have broken through & had consistent games is a disgrace – particularly at the level we are playing at. Many U20 youngsters are currently becoming very frustrated & angry at the lack of chances to progress into the first team. It doesn’t matter how well they perform – they are consistently overlooked for experienced pros who can go weeks or even months in bad form, yet retain their place. I know a youngster who plays for St. Mirren’s U20s who has faced Rangers on many occasions. He is a diehard Rangers fan yet he would most likely turn down the chance to sign for his boyhood heroes if the chance arose due to our terrible youth development policy. This is where a bigger problem lies, Rangers Football Club have already started to gain a dreary reputation for their youth development & if they continue on the same path then Rangers will miss out on many top prospects. For a younger player to choose among the likes of Dundee United, Hearts or Rangers – he will most likely turn Rangers down. 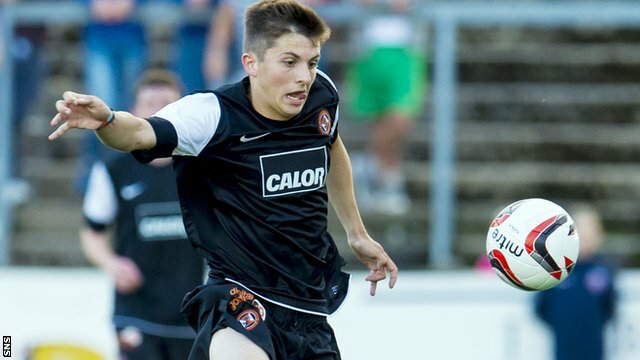 Anyone who has nfluence over him, his parents & coaches, are best to advise him against a move to Ibrox. 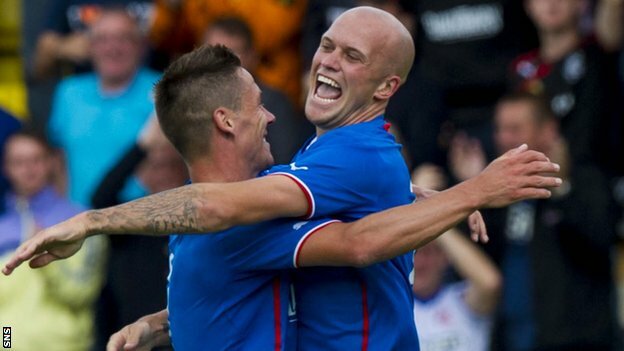 When news broke that Rangers had signed Lee Robinson – your first response was likely – “Who? 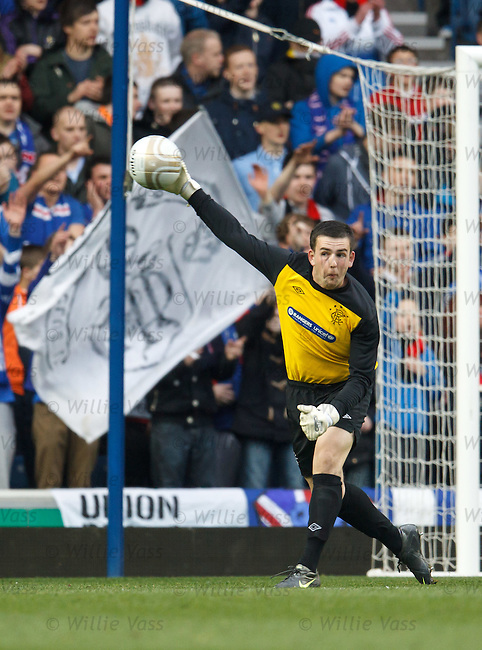 !” Then you remembered him as the 28-year old goalkeeper Rangers released in 2009 due to him not being good enough. He also admitted to not working hard enough and wasting five years at our club. Therefore he was brought back for another chance. What an embarrassment. What must the very talented U20 keeper Liam Kelly think now that he is the fourth choice goalie – when he is easily the second most talented keeper at the club. Now Rangers need to realize that they are in a very real danger of losing Kelly. That is an utter disgrace & a slap in the face to Liam Kelly. He is the number one keeper for Scotland’s U19s & very competent to be second choice, never mind third or fourth. That sort of condescending message will be noted by the team’s youngsters too & they simply won’t be happy with these pathetic sound bites. It would not be a surprise if half of the U20 side that won the Youth Cup last season are instructing their agents to find them new clubs. Rangers also lost a very bright youngster in Charlie Telfer this summer due to him not being given the chance to develop in the first team. This was another disgraceful handling of a talented prospect. This is a clear indication of a player who was not happy at Rangers seemingly non-existent youth progression. What has become of Calum Gallagher & Barrie McKay? Both have been dropped to the U20s even though McCoist still claimed Gallagher had been promoted to the first team (feel free to laugh). Now both need to be loaned out again in order to play first team football? If Rangers continue down this path of youth progression, not only is Murray Park being wasted, in the long term they will inevitably struggle to attract the top quality youngsters to the club. The model of bringing through youngsters from the youth sides should be a top priority, especially given the league Rangers are in. This is a clear way to vastly improve the side in terms of performances & in the future selling them on once you develop them for a significant fee. Considering the financial constraints of Scottish football it’s also the best way to do business. You can follow John McIntosh on Twitter @JohnMcIntosh19 & hear him on The Rangers Report Podcast – either on Podbean or through iTunes. McCoist is a moron, simply the worst manager ever in the long history of Rangers. The sooner we have an owner that shows him and his cronies the door the better. He has allowed seven of our quality young players to go out on loan when at least two of them, (Gallagher and McKay), are more capable than players that he wastes money on like, for example, Shiels. This guy is so preoccupied at playing his cronies and protecting his excessive pay cheque that the future development of the club’s footballing side is being destroyed. On the plus side, these kids will at least be getting better coaching than they are with the oldest rookie manager in football! Kelly should be the keeper in possession at present, not the hapless Simonsen who has a bad habit of gifting goals to the opposition and certainly not Robinson who has already been seen as a failure at the club! The saddest thing is that 2 clearly 2nd rate players such as Aird and Mcleod are looked upon as the best youngsters at the club when they would nt even make the U20s of any Spl team. I will easily admit this … i was furious at Rangers sending out 7 talented young players out on loan last night. i was even more angry that Gallagher and McKay were let go when in my opinion they could easily be competing for a place in the Rangers team. an utter disgrace. and i tell anyone this i would rather have Gallagher or McKay in a Rangers team over the likes of wage merchants like Peralta and Shiels to name a few who are not even near good enough to be playing for Rangers. the youth set up at Murray Parks needs sorted and quickly. its been noted for years and years even back to our heydays of winning trophys and playing regularly in Europe that we weren’t bringing through or giving the chance to good young players with talent. Shambolic by Rangers and this decision that McCoist and his inept backroom staff have made is a cheek to these hardworking lads whose dream it is to pull on the famous Rangers jersey and look at the mediocre players that stand in there way who are stalwarts in the Rangers Squad. as i said earlier its a damn disgrace. Do you really think rangers can win with a team full of young players, if you don’t mind still being in the bottom league of scottish football, that’s fine. A lot of over the top reaction to players getting sent out for experience .Only 3 are near the first team and of those Crawford and McKay broke through at the same time as Aird and McLeod who have stayed in the team , so the conclusion must be that they have not preformed consistently enough to do the same .Much as I think both could still make it ,I think that sums them up …up to now.Young Gallo is the one that did impress but he is better getting 6 months good experience as sitting watching the experienced strikers in the team. I agree we shouldn`t have signed another goalie but at 19 Kelly was never going to be first pick, not even Hearts are using a goalie that young.He has plenty of time on his side.It may be that we would have preferred to get rid of Peralta or Shiels , but they have contracts and we can`t just release them even if we wanted to. Factually too , we have only signed 3 ex players who are over 30 years old and while that is not ideal , with no scouting network (not McCoists fault) , and no money to buy players , bringing in players you know is a safe option. I keep pointing out that we did not have a load of kids at an age to make a breakthrough when we came out of administration and the ones we did have , we have used , with the best staying in the team .Dougie Strachans one sentence says it all as far as I am concerned.The voice of reason. William, sorry to correct you but Rangers did not come “out of administration” liquidation followed and many of the big players moved on for nothing as a result. However, the monumental strategic blunder then took place, which Rangers may never really recover from, with huge amounts of money being spent on journeymen when young talented players should have been fielded week in week out. (With a couple of seasoned pros to help them) The supporters would have embraced this approach. Remember for the past two seasons Rangers have been playing shelf packers and bin men!!! It is beyond belief the money which has been thrown at this and the belt and braces approach is still being implemented by McCoist, who is clearly scared to play younger players in case Rangers don’t make it back to the Premiership. Perhaps, bonus payments are at stake………..?? Andy , my point was, at that time we didn`t have a lot of young players waiting to come in , we played the ones we did have , with mixed success , which is what you would expect from young players . Starting that pre season with only 6 players ,there was no choice but to bring in journeymen players and probably overpay some of them to get them to sign ,like all signings some of them were successful and some of them not .I still don`t know what McCoist saw in Cribari for instance.Even expensive signings are a risk and a lot don`t work (see Man Utd) .I don`t accept that Rangers fans would have accepted a team of youngsters , if it had meant promotion was not achieved ,I have followed Rangers a long time and I know how impatient the fans can be , even to youngsters , if they are not winning . You are right though ,Ally is doing everything totally with the goal of returning to the Premiership in 3 years because not to do so would be unacceptable to the Board and the fans and he would probably lose his job.It is only natural that he does whatever he has to do to stop that happening , we would all do the same.I don`t agree with his handling of some of the young players , but it is easy for me to say that because my job and the future of the club does not depend on it. Also , a football manager does not control the finances of the club , he is given a budget by the board/CEO and has to work to it , if he has spent money we don`t have , but has not overspent that budget doing so , then the blame for any financial problems rest with the people setting the budget in the first place.I don`t rate McCoist as a manager ,because of his lack of tactical nous and ability to get the best out of players but some of the stuff he gets accused of is absolute nonsense.